ArtSeed’s newest initiative involves use of a wonderful cottage in Diamond Heights overlooking all of downtown San Francisco. These meetings will help launch what promises to be an exciting new chapter in ArtSeed’s thirteen-year existence. Come find out how you can be a part of the magic! Saturday, August 17, 10a. m. – 4p. m.: Artists, Classroom Teachers, Parents, Volunteers and Neighbors will see ArtSeed’s Studio Practice Cottage and discuss possible programs and challenges. We will be looking at best practices, regulations and guidelines for teaching there and in classrooms and other studio settings, and will brainstorm ideas for upcoming projects and next year’s overarching theme. Find out about artist residency and teaching opportunities and afterschool apprenticeships. We will build on stories and brainstorming that occurred Saturday August 10 around Michelle and the Cottage and share our experiences in teaching, Tips for curriculum arts integration, cross-referencing different standards for best practices and ideologies. Come find possible artists to work with your students or, if you are an artist, describe to us your perfect classroom or private teaching experience. All supporters are invited to please come share concerns/ideas! Please confirm with Josefa: 415-656-9849. We have uncovered ArtSeed art from previous years which has not been picked up. Take this opportunity to reclaim remnants of your creativity along with remaining art from the most recent exhibition. Please come to the above Cottage meeting or call Josefa to arrange another time. 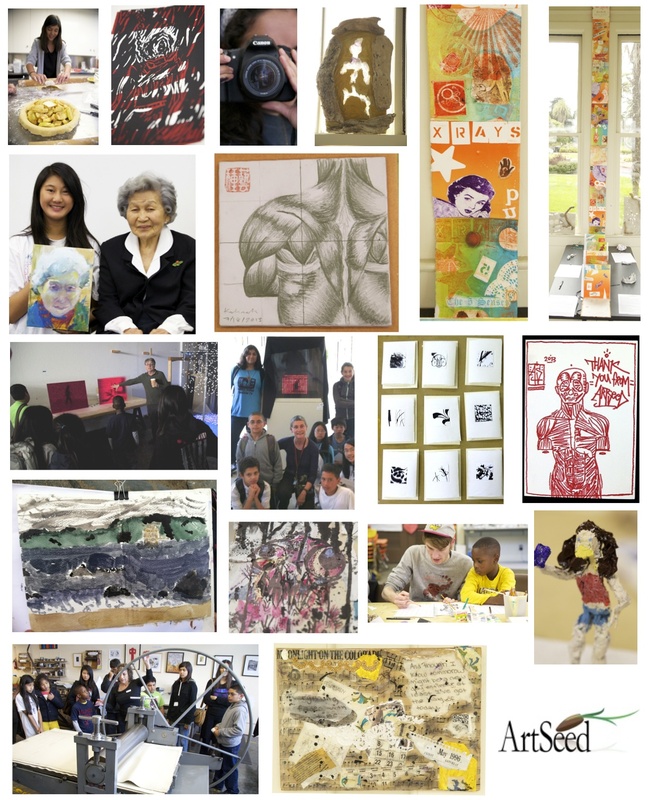 All ArtSeed supporters are invited to please come share concerns/ideas! Click to read more about Michelle Vignes. We send a great big THANK YOU to all the families, teachers and friends, artists and volunteers, sponsors and in-kind supporters who made all this possible! ArtSeed is funded in part by the Artists in Schools Program of the California Arts Council, a state agency, and the National Endowment for the Arts, a federal agency. Individual gifts and volunteer time from family and friends like you continue to be our base of support and is essential to our success – thank you! Click to see a full list of sponsors and in-kind donors (and please do call us if you see any missing names).